Never Want To Hire An Over-Promising, Under-Delivering Contractor Again? 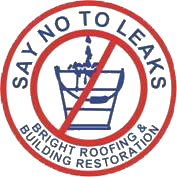 Make Sure You Are Working With A Qualified Roofing or Building Restoration Company. There are hundreds of companies that you can turn to. But there are some important considerations you really need to think about before you decide. What may seem like a "small" problem can give you the BIGGEST headaches if not properly done, with the right materials, by a qualified person. A truly qualified company will demand that their employees continuously improve and upgrade their skills, and we’re not talking about practicing their skills while they're ripping off your roof. We’re proud to say that all our Bright Roofing employees adhere to repair specifications as published by the National Roofing Contractors Association. We also spend countless hours on training through our different manufacturers and suppliers. Would You Hire A Roofing Company That Has Little To No Safety Training And No Continuing Training? You really don't want anybody, regardless of how cheap they might be, getting hurt on your property. You'll never have to worry about Bright Roofing employees. We are trained by OSHA in safety regulations. We understand how to be safe and we know how to run a safe job site. Anyone that is OSHA trained will be able to provide documentation of the training. Within the roofing industry, no continuing training is required. But to stay on top of things, we attend on-going manufacturers (Genflex, Firestone, Carlisle) training twice a year for 8 hours per person, as well as weekly training sessions in-house. The problem with subcontractors is that you don't know who they are, what their training is, where they got their experience, and the quality of work they produce. Add to that that the general contractor hiring the subcontractors won't be able to answer those questions either, and you have a potential ugly situation. Companies use subcontractors when they don't have employees capable of doing the work themselves. Since we are not only a roofing specialist but also a building restoration specialist, we are able to solve most of the problems and situations that we run into on any job. That knowledge allows us to use our own employees for your work. By using our own employees, and not subcontractors, we have more control over your project. We know that our guys can make decisions on how to handle any situation that arises while working on your job, they are going to show up, and you don't have to worry about whether or not the subcontractor has insurance, safety training, technical training, etc. Because our crews are not subcontractors, we can meet with everyone every two weeks to discuss jobs that are done and how they went; jobs that are in progress and how they are going; and upcoming work. Our Total Quality Management Team meets on a regular basis to discuss any issues that need to be brought up, whether it be collection, paperwork problem, or new hires.